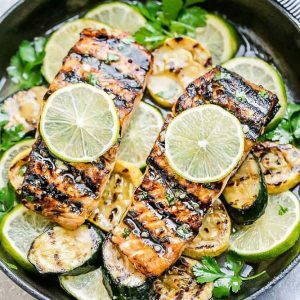 Salmon seasoned with honey and lime is so light and refreshing. Pair with rice and steamed veggies for the best healthy dinner. Season salmon generously with salt and pepper. In a small bowl whisk together the melted butter, olive oil, honey, soy sauce, lime juice, lime zest, and minced garlic. Reserve 1-2 tablespoons of the sauce to brush on the salmon once finished cooking.